The rest of the cast also did a great job, in a play that has nearly 50 characters, requiring doubling, tripling and quadrupling of parts for a company that has only 11 actors. The scene where Princess Katherine, played by Ellen Adair, learns English from her attendant Alice, played by Ginna Hoben, is hilariously done. Various Dukes and Earls were played by Scot Carson, Raffi Barsoumian, Paul Reisman, Daniel Kennedy, Christopher Seiler, Josh Carpenter, Chris Johnston, and Alisa Ledyard. 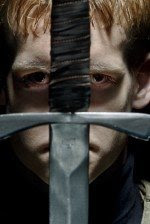 The play strongly suggests what a nation can achieve when it is united under a charismatic leader; yet Shakespeare doesn't flinch from raising the whole question of the legality of Henry's war, nor does he avert his eyes from the inevitable horrors that war brings in its wake. Something to think about. Great play, great production.